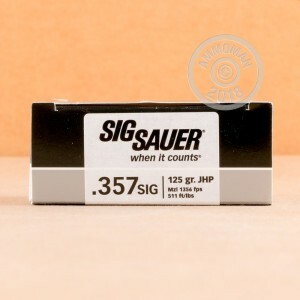 357 SIG comes from a joint effort of the Swiss company SIG Sauer, and the American company Federal Cartridge. A touch longer than the .40 S&W and with significant stopping power, this round is used by hundreds of different law enforcement agencies. 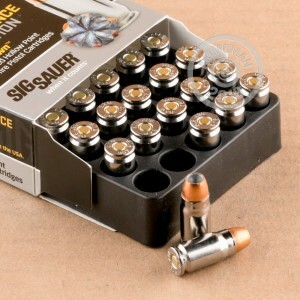 SIG Sauer V-Crown ammo is designed to retain the maximum amount of weight, while still expanding and forcefully striking the target. With a toothed cannelure midway up the bullet and a stacked hollow point design, this bullet has an edge up on other hollow point ammo. It is also designed to have less flash and extra ease in all its transitions within the gun than other cartridges. Try 125 grain jacketed hollow point V-Crown ammo in your carry gun and see how it does for you!